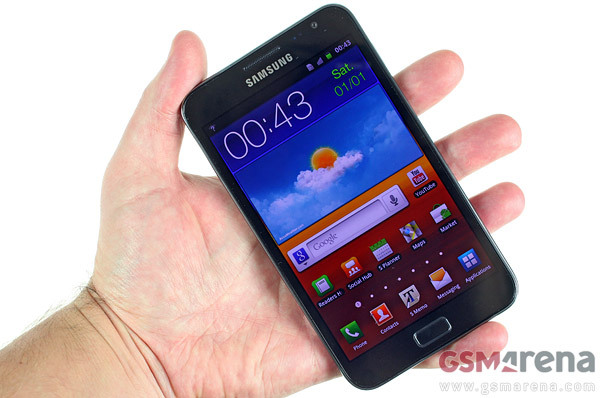 So, it’s here – it because we’re still not quite sure what to call the Samsung Galaxy Note. It’s too big to be a phone, a 5.3″ is quite a bit bigger than even the 4.65/4.7 inch screens we’ve been seeing lately. It’s not quite a “tablet” either – the Note could be used as a phone (it looks a little weird but…) – but it certainly packs the processing power and screen estate of a tablet. The 1.4GHz dual-core CPU mated to a Mali-400MP GPU showed a lot of promise in early benchmarks. We’re hard at work on a more thorough preview for you guys, but the first thing we did as soon as we received it, is put it through it paces and see how it fares. We let it sweat in our customary batch of benchmarks, to see how the Exynos chipset performs after the clockrate speed bump (we’re used to the one in the Galaxy S II, which is clocked lower). Quite unsurprisingly, the Samsung Galaxy Note aced the CPU-specific exams – Linpack and BenchmarkPi. Linpack especially liked the higher clock speed and posted results nearly 20% higher than the Galaxy S II. Moving on to NenaMark 2, the Galaxy S II gets to keep its crown here, but you have to keep in mind that the Galaxy Note has about 2.6x the number of pixels that the S II has. In other words, a 46% lower frame rate is actually faster than we expected. The LG Optimus 3D wouldn’t run that benchmark. The Galaxy Note is more demanding of the Exynos chipset than previous phones – it’s not just the higher pixel count, the bigger screen means you actually see more detail so it all has to be rendered perfectly. The Note doesn’t seem to have any problem in that department – it blazes past some of the high end droid phones and will beat most tablets hands down (since they use pretty much the same chipsets as their phone counterparts). By the way, this is also the sort of performance we’ll be getting from from the Samsung Galaxy Tab 7.7 since all the relevant specs are the same. This test unit was kindly provided by CT MIAMI, a Samsung distributor for Latin America. The Galaxy Note will be available at CT MIAMI for wholesale customers on October 24 for $699.